Bletchley Ladies will take on neighbours Olney Ladies next Wednesday night in the Alliance Cup final at Franklin's Gardens, but they will have to settle with playing Championship 2 rugby again next season. It would be disappointment for Bletchley in their play-off game against Barnsley on Sunday, going down 42-33. After an amazing season, Bletchley Ladies found themselves winning the Championship Midlands 2 league and travelling up to Broadstreet Rugby Club to meet Barnsley Ladies in the playoffs for promotion to Championship 1 North. Both teams had had a similar season, with two teams at the top of each league vying with each other for the top place, well ahead of the other teams in the league – it promised to be an interesting game. Bletchley opened play; Barnsley took possession, but after a few phases knocked on, allowing Bletchley to get their hands on the ball. They won the scrum and drove forward. An accidental block gave the scrum to Barnsley. They took possession, then a penalty allowed them the opportunity to kick up the filed; the ball didn’t make touch. Alex Sutton attempted to secure it, but just got a finger to it before it went out, giving Barnsley the lineout. Again they moved through the phases, then Bletchley ripped the ball from a scrum and kicked it deep into Barnsley’s territory. They caught the ball, then returned the penalty, which Rachael Taylor kicked to touch. Bletchley secured the lineout, then was further assisted by a penalty which Emma Lucey took quickly to move into Barnsley’s 22. Barnsley have a brief respite with a penalty from Bletchley, but only gained a few metres, with a lineout just out their 22; this was secured, followed by a couple of rucks before Bletchley ripped the ball and pushed back. An unused maul gave Barnsley the scrum again, but a couple of rucks later, Bletchley ripped it again, passed out to Caroline Collie who ran in the first try between the posts. Taylor added the extras; 7-0, just five minutes into the game. Barnsley stepped up and defended hard. Bletchley took the catch from the restart and pushed up into Barnsley's territory. Barnsley took a loose ball and pushed back, but couldn’t get out of their half before they were forced into a kick which went straight out. Bletchley took the line out and pushed back, but a knock on, followed by a Bletchley penalty gave Barnsley the opportunity to move play up to Bletchley's 22. They secured their line out, set up a short maul, then passed out along the line. Fortunately for Bletchley, they gave a penalty for holding on in a ruck allowed Bletchley to clear their lines and work their way back up to the other end of the pitch. This yo-yoing of play continued for a good ten minutes. Finally, after a long series of phases Barnsley dropped the ball in the middle of Bletchley's half. Clare Stacey spotted a gap, picked it up and flew down the pitch to secure the second try between the posts. This was also converted, opening the gap to 14-0. Five minutes later, Barnsley came back in the game. Two unused mauls from Bletchley helped them work up the pitch, then a penalty in Bletchley's 22 secured it for them; a quick tap and they had their first points; 14-5. Ten minutes later they added to this; from the restart they took the ball and worked it out of their 22. Bletchley ripped the ball, then had a scrum after Barnsley came in from the side at a ruck. They moved the ball through the hands, then gave a penalty, giving possession back to their opponents. Barnsley kicked to touch, then pushed back into Bletchley's territory. Play moved back and forth between the teams, but finally Barnsley tackled Bletchley out, secured the line out, set up a maul, passed along the line and put the ball down to move up to 14-12. A minute later, Bletchley's liberty King reopened the gap with a corner try, quickly followed by a lovely paly between Collie, Taylor and King, resulting in another try from Collie, between the posts, giving a half time score of 26-12 to Bletchley. Barnsley made a few substitutions at half time and came back fighting. This time it was their turn to take the first points in the first five minutes, using their well set up maul to push over the line; 26-17. Bletchley replied three minutes later with Collie’s hat trick between the posts, added to with Taylor’s boot; 33 – 17. It looked like the teams were taking turns; Stacey took the restart ball on the bounce, pushed up and then set up the ruck. Bletchley patiently worked through the phases, moving towards Barnsley's half, only to have Barnsley force a step out, giving them the line out. They pushed back, then kicked the ball over the line. Stacey dropped on the ball to secure Bletchley the 22 drop out. Barnsley took the catch, pushed up and camped out on Bletchley's line. Bletchley fought hard, but gave a few penalties, allowing Barnsley to stay there. 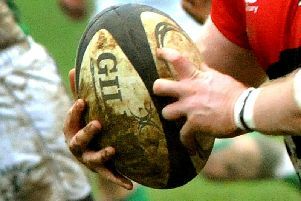 An injury stop paused the game for a few minutes; Barnsley secured the scrum to restart the game, passed out along the line and finally took the try they had been working for; 33 – 22. Now Barnsley were on a roll. Bletchley fought hard, really digging deep for their bulldog, but after fifteen minutes of sheer determination from both sides, Barnsley closed the gap right down with a try in the corner; 33-27. Another ten minutes of hard tackles and push, with a yellow for Bletchley after repeated infringements, they moved ahead, this time with the kick finding its spot; 33-35. Three minutes later, Barnsley moved the game out of Bletchley's reach. Bletchley kicked deep to restart play; Barnsley took the catch, were tackled and set up a ruck. Bletchley didn’t release; Barnsley took a quick tap and ran at Bletchley. They passed back form a ruck and kicked down the pitch, chasing strongly to take the catch. They worked through half a dozen phases to take the final try of the match, again converted; 33-42.